Moving to a new country and new climate presents pleasant surprises. A future expat may not expect to write How to Grow Vegetables on their list of ‘items to research’ but this may be exactly what they discover themselves doing in a few months time in their host country. Growing vegetables may at first seem like a mundane job to those who have never done this, but as an expat this offers not only fresh produce on your dinner table, but a way to meet people, a new hobby and fresh air. The well-organized ‘future expats’ plan for culture differences, learn about the new language, organize their finances, even Google information about the town they’ll be living in. And once the new expats are settled in they research local networks, visit local attractions and try local food. Then one day the expats are sitting in the back garden and they realize that with a little attention, they could make that garden as much their home as they have the house. Or the expats are getting frustrated paying a lot more for food in the shops than they did at home. Or the expats simply decide they need a new hobby. For the expats moving to the UK, gardening will be a relatively easy job. The climate and growing season in the UK means more flowers, shrubs, fruit and vegetables can be grown in the UK than in many other places. Whatever country you find yourself living in, growing vegetables means you have the opportunity to discover new food—or have fun growing food you once thought were exotic imports, with the added benefit of bringing it to the dinner table. If you become very successful and your veggie patch turns into a full garden, consider selling your produce at local markets or on the side of the road, depending on how locals in your host country generally do this. 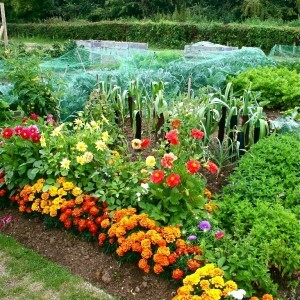 As a hobby, growing one’s own vegetables is becoming increasingly popular in many places, including the UK. Kits for raised vegetable beds can be found online and in most garden centres. Potato planters (upright bags, or bins) are also increasingly popular and inexpensive space saving mini vegetable gardens. Depending on your space, you could grow herbs on a windowsill, tomatoes in containers on a balcony, or plant a row of sunflowers and pumpkins along the base of a sunny wall. According to the Independent, a daily British newspaper, a quickly increasing number of Britons are responding to the recession by turning large areas of their gardens into vegetable plots. In the UK an increasing number of Grow Your Own Movements have started, including Growing Schools, guerrilla gardening movement, garden share schemes, and Landshare—all designed to get people out and gardening and making use of land to grow food. If you don’t have room for your own garden, then sign up for space at an allotment. Allotments are tracts of land set aside by the local county council and divided up into gardens for local residents. For a small fee and some time spent on a waiting list, you could have a decent size garden for growing your own vegetables as well as a valuable community of fellow gardeners who can give you hints and tips for growing in the UK. And apart from saving money, meeting people and starting a new hobby, the time spent in moderate exercise out in the fresh air is good for anyone and will surely help with those blue expat days. Loved your post! That’s some excellent advice for new expats to explore gardening in their new homes. We live in a flat, in Prague, and have balconies that will hopefully be planted with a small container garden of tomatoes and flowers, etc! When you become an expat, you not only explore your new home, but you also end up exploring your soul. Many expats turn to writing, photography, and many other hobbies when beginning a new life overseas. Some of these hobbies even go on to become a line of work for the new expat. You just never know–and should never be afraid of branching out into new areas. These new areas enrich your soul and your life like never before. interesting post.. wish we can have that opportunity here also..
Really glad you enjoyed this. Good luck with your balcony garden–you can really do a lot with balconies, more than people expect! And you’re so right that you explore and learn so much about yourself than what you might have if you had never become an expat. I know I certainly have. Thanks for that! My aunt recently harvested her garden full of tomatoes before the winter really set in, and I find myself the owner of two or five buckets worth! Of course I couldnt eat them all, but I did find a website full of tons more tomato recipe there. A whole website dedicated the topic!! Crazy what you can find on the internet these days! !